Complete information and video below. Single click images to enlarge. 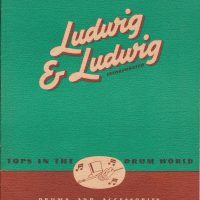 The Ludwig and Ludwig “Top Hat and Cane” model was a very limited edition drum set initially made in 1941. 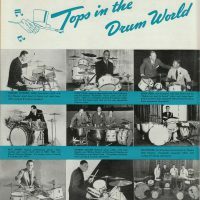 It was the absolute top of the line drum set available at the time. 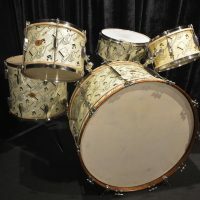 Due to to the extremely limited supply of materials during early World War 2, only a very small number of the sets were made in 1941 and then discontinued by 1942. 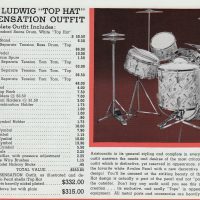 The Top Hat model was never offered in any subsequent Ludwig catalogs, however a small number of the sets have appeared that were date stamped 1946. Only about 20 of these Top Hat and Cane sets are known to exist worldwide. 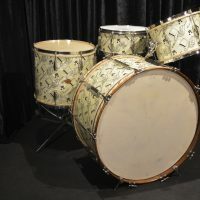 This set is a 1946, 26×14, 16×14, 13×9 with a matching 14×6.5 snare drum. This set is an all original, single owner set recently discovered in an attic in Connecticut. 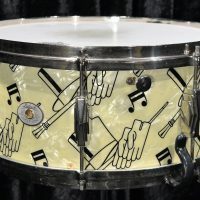 The bass and snare are both date stamped “4608” indicating they were made in August of 1946. 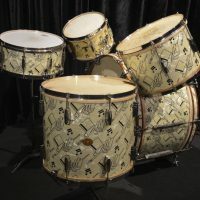 The bass and toms all have the 1946 era brass oval Ludwig and Ludwig badge however the snare has the earlier Ludwig and Ludwig white oval badge. I will also include an 11×7 tom that I acquired separately. 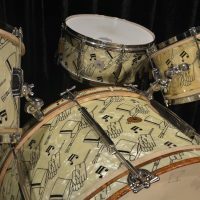 This drum was not part of the set originally but I’m glad to include if the full price is paid. All of the drums and hardware are gleaming like the day they were made. There is virtually no yellowing. Check out the pics with the heads off. 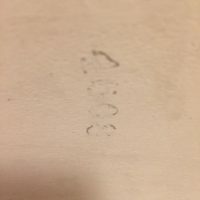 You have to look extremely close to see any sign of fading. Just look at that amazing shine!! The bass and toms still have their original calf heads. 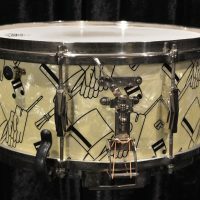 The snare has it’s original wires with modern heads. 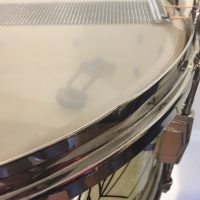 There is a tiny burn spot on the snare roughly 1/4” round and a very small ding in the snare drum’s bottom hoop (see pics). 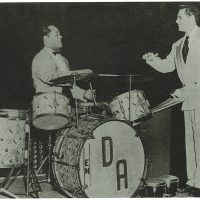 The bass drum hoops show some claw marks. The set is otherwise flawless. Don’t let the near new condition of this set confuse you. THIS SET IN AN ORIGINAL 1946 SET. This is not a re-issue or replica. This is 100% the real deal. See the set in action in the video below. Due to the extreme high value of this set it will ship by freight in a single wooden crate. This is by far the safest and most economical way to ship of this value. Plan on around $600-$800 for US shipping. I will ship internationally. Contact me for a quote. .
PRICE $27,995. Serious offers considered. 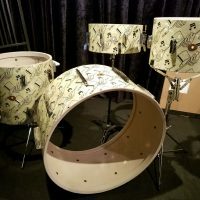 Zak Starkey’s The Who 2012-13 Quadrophinia DW Custom Drum Set. Complete! Authenticated! $29,995. 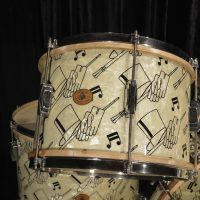 Dennis Wilson’s Beach Boy’s Blaemire “Monster Kit” Authenticated! $22,495.